The Questar telescopes have since 1954 been recognized as an elegant and refined practical tool for astronomy. Among the patented features that set the 3-½ astronomical models apart are the functional Star Chart and Moon Map that are provided on the Optical Tube Barrel and with the Dew Shield of each telescope. These charts are a very complicated to make item, and so this among the characteristics of the Questar that have people equating them with less and less common old-world craftsmanship as well as their high performance. 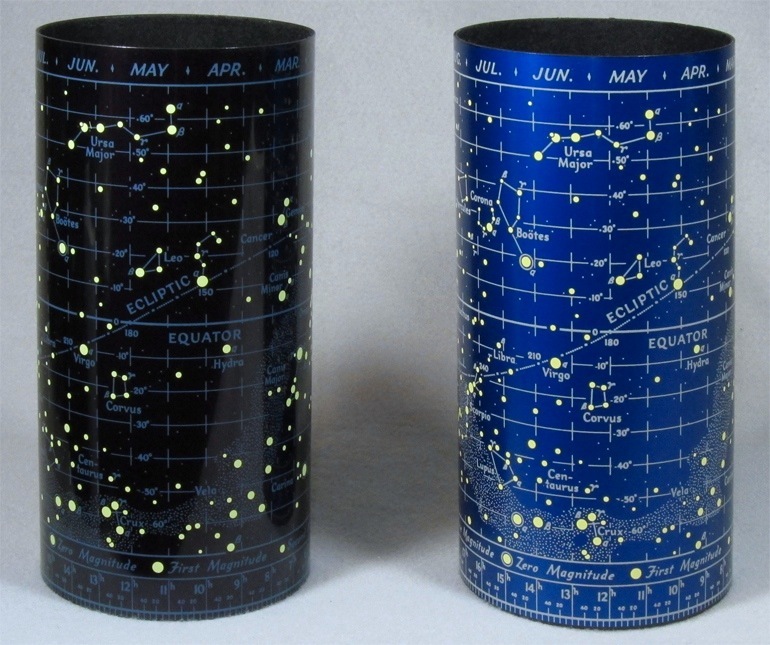 Right: Questar Star Chart as provided with the 50th Anniversary Model telescope. The Star Chart pictured here is framed and on display as part of Company Seven's showroom museum collection - absolutely stunning (185,386 bytes). Click on image to see enlarged view (426,639 bytes). The charts are provided as a standard feature of each new Questar 3-½ astronomical telescope. The charts are made from a precise flat aluminum stock that is anodized and then printed with the chart pattern. Then this flat map (an example is shown at right) is precisely rolled into a final cylindrical form and affixed into place. The Moon Map is installed onto the barrel of the telescope optical tube, while the Star Chart is permanently attached on the slip-on Dew Shield. The Star Chart and Moon Map are provided on every Questar Standard 3-½ made since 1954. Scaled down charts are provided on the Questar Duplex instruments made since the late 1980's, this having been an option added beforehand and optionally deleted on current production Duplex. The charts provided on the Duplex telescope must be scaled down since the Duplex optical tube assembly Mounting Collar takes up some of the otherwise available length of the barrel. 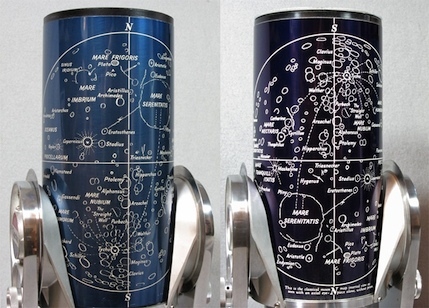 In the fall of 2002 scaled up versions of the charts became available as options for the Questar 7 telescopes barrel; the new owner reversed the historic arrangement in that the barrel incorporates the Star Chart with the Dew Shield covered by the Moon Map. 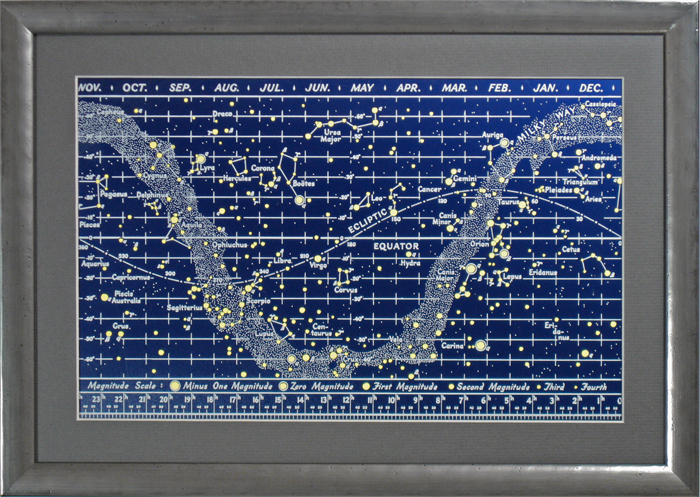 The charts provided with the telescopes are silk-screened onto a smooth anodized aluminum surface. The Star chart provided with the Questar 50th Anniversary Model are made in the manner in which these charts were originally produced from 1954 and into the 1960's, this is with the surface embossed then anodized and inlay painted so that each feature has a palpable depth; this is a tedious and costly process made more complicated by the fact that fewer and fewer US based manufacturers exist with the skill and interest to do this work for Questar. with the celestial globe in Mercator projection..."
The Questar Star Chart is a rectangular projection where the Right Ascension (similar to longitude) and Declination (similar to latitude) are applied onto the chart similar to an x and y orientation. This appears similar to how star charts were often made with a Mercator style projection. 1. to learn how to navigate the night sky. 2. a handy reference from which one can obtain celestial coordinates accurate enough to use when indexing up the Setting Circles during Pole Alignment. Right: Questar Star Chart/Dew Shield in dark purple as included with telescopes made from 1956 to 1990's (left), alongside current production version (right). The blue version at right is as provided with the current production Standard Model telescope (84,759 bytes). Click on image to see enlarged view (235,324 bytes). Right: Questar Star Chart and Moon Map as provided with the 50th Anniversary Model telescope (60,184 bytes). The Moon Map is applied directly onto the optical tube barrel and unlike the star chart, this is permanently attached. Conceptually speaking, this is the traditional map produced since the Questar was patented in 1953. It is a handy reference in finding the major features of the Moon as visible from Earth. The original Questar Moon Map shows an orientation of the Moon that is right side up and correct left to right, as we see it with the naked eye, because those early telescopes incorporated an image erecting prism. Later and current production telescopes incorporate a Moon Map with an orientation that corresponds to the perspective when observing the Moon viewing straight through the Questar Axial Port; so East and West are a normal perspective while North and South are reversed. This view does not correspond to what people see when routinely looking through the eyepiece in routine use since in the eyepiece North and South are properly oriented but East and West are reversed. We would like to see Questar revise this but some traditions are not easy to change. ELEC. DRIVE: 2.7W 115V 60~ AC. * this originally reflected the relation of the limbs to Earth's horizons as the Moon moves across the sky; that is for the observer in the Northern Hemisphere. So the east limb of the Moon is facing/heading west as the Moon moves across our sky. 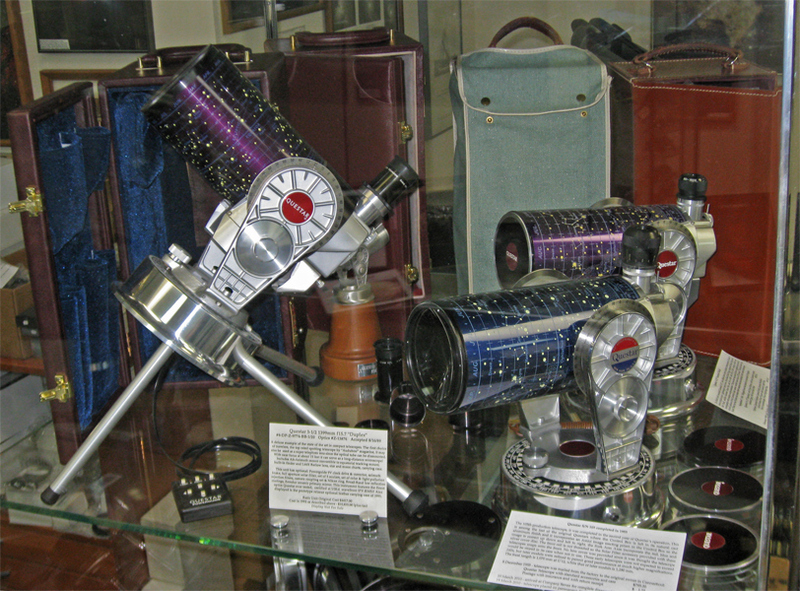 Left: The Questar Moon Map on 1955 and 1961 model telescopes shown at Company Seven (79,554 bytes). For quick reference note the large region Mare Serenitatis at top right on the early Questar 3-½, then lower left on later models. Click on image to see enlarged view (274,969 bytes). The Color Changes and Why? 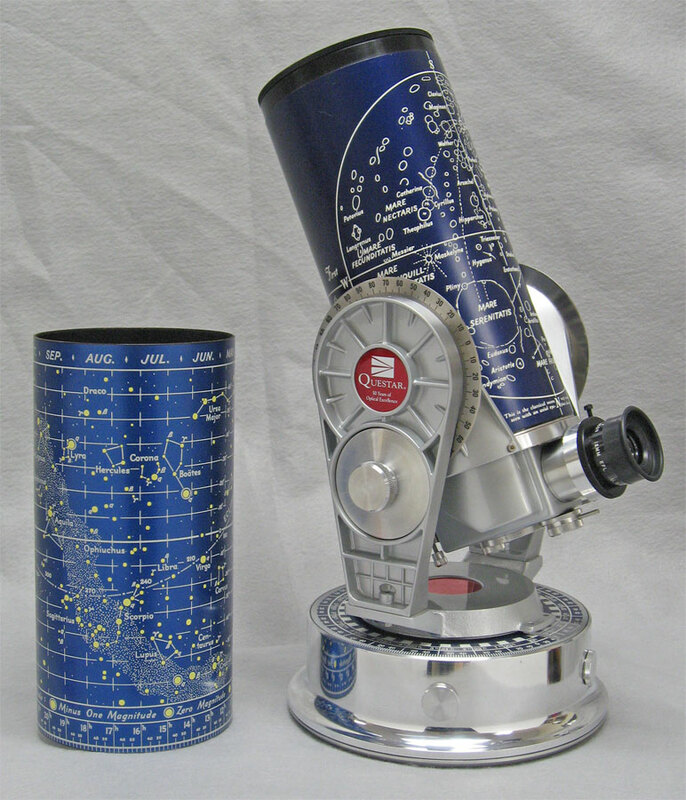 On the Questar 3-½ astronomical telescopes made from 1954 into 1956 the background color tone of the distinctive Moon and Star Charts were a lustrous gloss deep blue. From then through the 1980's and into the 1990's the background was an obvious purplish-blue although we see some production lots where the covers appear a very dark blue. By the mid 1990's while evaluating new telescopes as a part of our routine in-house quality control process Company Seven's technicians noticed subtle changes in the background color tone. The color tones had generally been consistent on both Moon and Star charts, but in time the shades of purple on the dew shield and of that on the telescope barrel covering often did not match as well as we preferred. This was particularly notable when the Dew Shield is extended and the Moon Map becomes visible alongside the Star Chart. In several instances Company Seven returned the new telescope to New Hope requesting a more considered matching and replacement of the components. Questar would do the work for us, but in turn complained to the company who supplied these components. The subcontractor who performed the anodizing (in the finest tradition of many American makers of the time) suggested that we were simply too demanding and finally simply declined to make these suggesting it had become too complicated an effort for their factory to maintain the consistency of the purple coloring. When an alternative source was found to do this work they could not offer the earlier shades of purple so a blue tone was selected. And this is why the consumer Questar telescopes color were changed from the prior gloss purple to first a satin medium blue which was initially bit too obvious, and in time this was toned down to the current satin blue as is shown on the Anniversary Model above right. 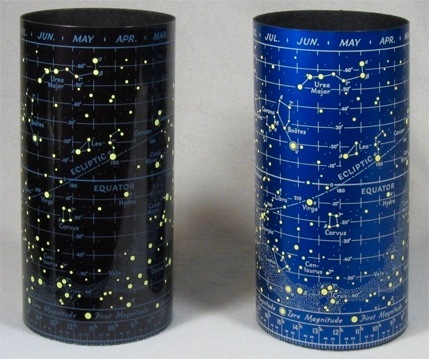 The background color of the Questar telescopes barrels has varied in tone somewhat over the recent twenty years from lighter to darker shades of blue, as has the match in tone between the Star Chart and Moon Map provided on some individual telescopes. Click on image to see enlarged view (416,128 bytes). In the 1990's a Questar switched from purple to through several shades of blue background, we at Company Seven were amused to hear people comment about how they prefer the 'original purple background'. When it is clear in the image to the right, the original telescopes start chart and moon map backgrounds were blue. Do not store the telescope in an are where it can be exposed to intense direct light, sun or artificial, over any extended length of time. This can cause the finish on the star chart and black anodized component of the telescope to fade. If the chart is handled, it is a good idea to gently wipe it down with a clean soft damp cloth and allow it to dry out in a climate controlled environment. If fingerprints are left on a surface then over time the enzymes can actually etch that pattern onto the telescope coated surfaces of the metal and even on the Corrector Lens. When the Questar becomes covered with dew or frost, then it can be placed in the case for safe keeping. But as soon as it is practical, one should allow the case and telescope to acclimate to room temperature, then open the case and remove the telescope thereby allowing both the case and telescope to air out. We invite you to visit our showroom near Washington, D.C. to see a Questar first hand or contact us by E-mail to info@company7.com, or by telephone 301-953-2000. The showroom is open Monday to Friday 11 am to 6 pm, Saturday 11 am to 5 pm. We are closed on Sundays, on U.S. Holidays, and from 25 December through 1 January inclusive.